On the first anniversary of multimillionaire Peter Lanskard’s murder, his daughter hires former Pittsburgh detective Trevor Galloway to investigate. I tilted my head, giving her a skeptical look. Galloway’s had more than his share of trouble. Currently, he’s retired on disability after being held captive by members of a drug cartel. Tortured and forcibly injected with heroin, he’s a barely recovering addict quick to fall back on drugs when the going gets rough and he occasionally has flashbacks about his capture. He’s also the target of a shadowy figure called The Lithuanian, whose cousin he killed in the aftermath of his rescue by fellow officers. No one in Centre County needs to know that, however. Not yet, anyway. Because of the athletic ability needed to maneuver over snow to the shooting point and fire a rifle from such a long distance with such accuracy, Police Chief Colby accuses Seth Wrangle, who, with his brother and business partners runs a biathlon camp. A former Olympian, Seth is rumored to have been on bad terms with Peter who wanted to buy the land on which the camp is built. Wrangle’s version is very different. He planned to sell to Peter, just not immediately. Galloway also learns something no one else has mentioned. Peter Lanksgard was terminally ill. Did the millionaire hire someone to kill him? If someone from the biathlon camp is involved, Galloway has only a few days to investigate before the current competition ends and the camp closes. In a small place like Washaway Township, everyone knows everyone’s business, and the local paper makes certain all know why Galloway’s there and what he’s after. Soon, he’s has so many run-ins with the locals he’s beginning to think he should rent a room in the county hospital. To further complicate matters, The Lithuanian has arrived in town and is stalking Galloway. The trouble is, no one but Galloway has even glimpsed the hit man. As far as anyone else knows, he’s a shadowy figure, a phantom who could possibly be a figment of the former detective’s drug blackouts. Galloway has meds to keep the hallucinations at bay, but they interfere with the moments when he puts himself in the killer’s place and actually sees how the crime happened. When the owner of the inn where Galloway’s staying is beaten, the evidence points to him as much as it does to some enigmatic, unseen gunman. Then another death occurs, one of the security team hired to protect Lanskard, and that makes Galloway wonder if he might’ve committed the crimes during one of his flashbacks. With a time limit on his investigation, and the local police now eyeing him for assault and murder, Galloway has to work fast to prove his innocence, both to the Centre County PD as well as to himself, while he finds the killer, even if he has to do it in the midst of a biathlon competition. In this taut thriller set in a Pennsylvania midwinter, one can almost feel the bitter cold as Galloway tramps through the snow in his pursuit of a killer as elusive as the hit man pursuing the detective. 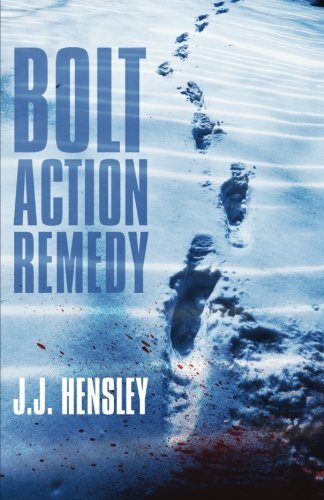 The self-doubt of a man still suffering from the hold his forced addiction has over him as he tries to differentiate between the memories he thinks are real and the reality of his current situation makes Bolt Action Remedy a can’t-put-it-down novel. In Trevor Galloway, author Hensley has created a likable, if contradictory and multifaced character. Though he describes himself as humorless, there is plenty of sharp crime noir humor in Galloway’s narrative. A loner through choice, his few attempts to reach out to others, particularly the pretty young doctor who continues to patch him up after each confrontation, is touching and hopeful. His reactions when Max, owner of the inn, is hurt, is that of a man who cares, whether he wants to admit it or not. These and Galloway’s own admissions make him into a very human protagonist who could, with a little effort, become a genuine hero. Bolt Action Remedy is a novel with a plot as twisted as a slalom course and a rush as exciting.